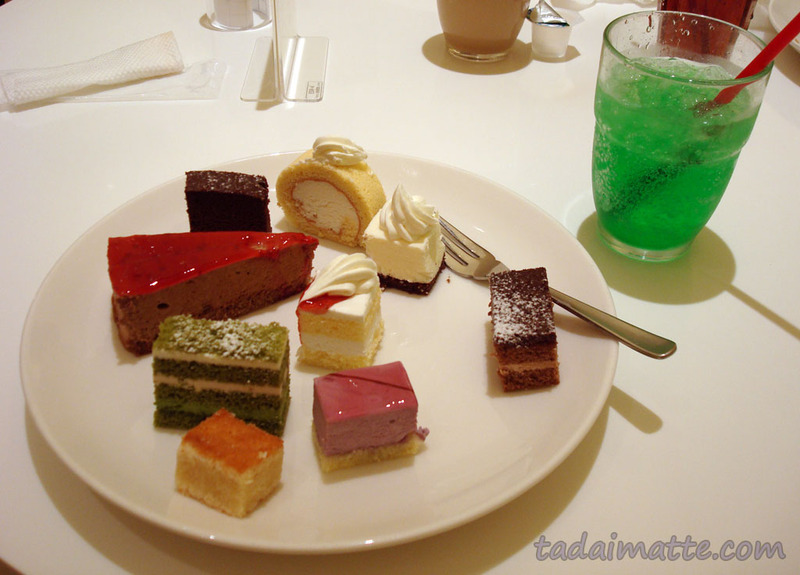 Drinking melon soda and feeding my expensive cake habit. As you might have guessed, I have a penchant for cooking, and recreating food that I loved in Osaka is usually my top target. 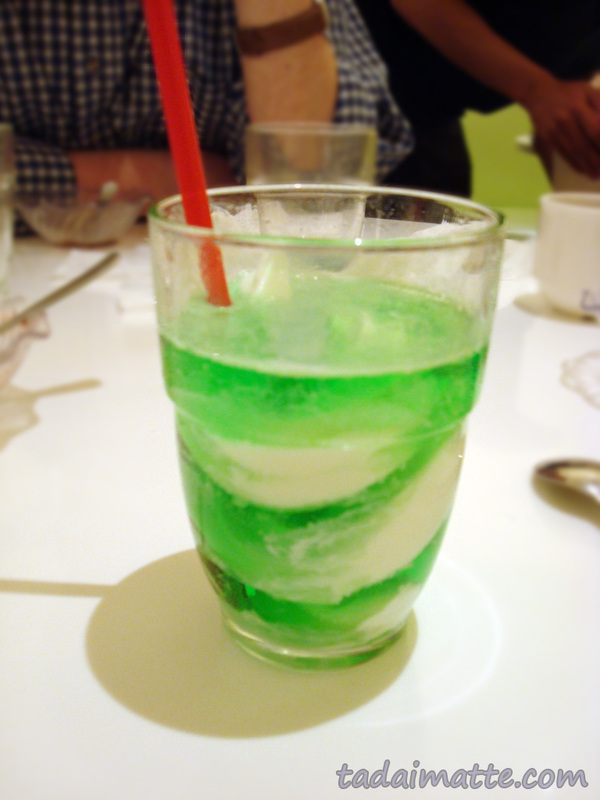 One thing that I've managed to duplicate recently with some success has been melon soda. If you've lived in Japan for any amount of time, you understand the ubiquitousness of melon. It's a favourite flavour, and one that I think might have even met with more success in the western world if it were properly marketed. Alas, it is not - the amount of hassle I had to go through to make a satisfactory melon soda (and it's far from perfect) from the materials I could find here is proof enough. But surely, you might say, if this 'melon soda' thing is so popular, it's been imported? Actually, it has. A company called Sangaria markets their aluminum-bottle melon soda in the U.S. and Canada, including, occasionally, select grocery stores here in Toronto. I paid a hefty $5 USD each to buy these at North Market in Columbus, OH last year and came away extremely disappointed. You might recognize Sangaria as the producers of those cheap aluminum-bottle Ramune drinks in Japanese vending machines...and if you've ever drank one of these, you know they do not hold up to the real thing. The soda goes flat within 5-10 minutes, seems to warm abnormally quickly, and has a distinctive tinny taste. I haven't noticed the carbonation or taste issues with Fanta's aluminum bottles, so I can only conclude that it's something about the 'cheap' variety that Sangaria and other 100-yen soda makers provide. As I've mentioned before, Coca-Cola has importing issues when it comes to their Japanese products, so it's unlikely we'll see Fanta Melon or Fanta Melon Cream over here at any point. So what's a girl to do when she has only sub-par melon soda to tide her over? Well...first, hit eBay, if you value authenticity as I do, and then when the prices scare you away, try your hand at making it yourself. As with Italian sodas and any fountain drink, you'll need to start with a concentrated syrup. This was tough, because the big-name brand that's easy to find in Canada, Torani, does not have a melon flavour - only watermelon. Apparently, Starbucks used to sell under their label and use a Torani 'melon' syrup in their matcha drinks (...what?) but it's now discontinued and the only Torani type I can find is watermelon. You're definitely going to need a cantalope or rock melon flavour! In the end I settled on a Monin syrup because I could net a 1-litre bottle from Amazon for less than $15. The colour is not right - melon syrup is supposed to be green - but the taste is extremely close. I also picked up some kakigoori melon flavouring; that is, the concentrate that is used to flavour shaved ice. If you have access to this from a local Asian grocery, it's a great idea. That's enough rambling - on to the proportions! Pour the soda water into your glass and add the syrup, stirring gently to mix well. You can add a few drops of food colouring (2 is often enough) to get the authentic colour. Add ice until your glass is full. For a cocktail look, add the syrup first and do not stir until serving - this recipe can be used with melon liqueur as well. Prefer melon cream soda to the original? Just add a scoop of vanilla ice cream, and enjoy!